On 19th February 1790, Thomas de Mahy, Marquis de Favras made history: he became the first nobleman to be executed without class distinction from commoners. His crime? Trying to save the royal family from the dangers of the French Revolution. Born in 1745 in a noble and ancient family, M. de Favras was a fervent royalist who served in the army with distinction. Although he at first approved the change from an absolute monarchy to a constitutional one with a Parliament, he was soon disillusioned with the French Revolution, its violence and its degradation of the royal family. Believing that a counter-revolution was necessary, he became involved with the plans of the Comte de Provence, Louis XVI's brother, to save the royal family. Unfortunately, he was imprudent enough to take into his confidence certain officers of the National Guard, who betrayed him. A pamphlet began to circulate throughout Paris claiming that Favras had planned to rescue the royal family from the Tuileries Palace, to declare the Comte de Provence regent, to kill Jacques Necker (the Finance Minister), the Marquis de Lafayette (the commander of the National Guard) and Jean Sylvain Bailly (the mayor of Paris), and to hire a force of 30,000 soldiers to lay siege to Paris. Favras and his wife were arrested and imprisoned in the Abbaye Prison. As for the Comte of Provence, he went straight away to the Paris Commune, where he disavowed Favras by saying: "From the day when in the Second Assembly of Notables I declared myself concerning the fundamental questions which divide men's minds, I have not ceased to believe that a great revolution is impending; that the King, by virtue of his intentions, his virtues, and his supreme rank, ought to be at the head of it, since it cannot be advantageous to the nation without being equally so to the monarch; and, finally, that royal authority should be the rampart of national liberty, and national liberty the basis of royal authority." The Prince was applauded. Favras instead was hated. A fortnight later, he was separated from his wife and sent to the Grand Chatelet to be tried. The Chatelet had to be closely guarded for fear that the people may kill him. Throughout the trial, which lasted two months due to lack of evidence and confused witnesses' testimonies, the people were constantly shouting "To the lamp-post with him!" and Lafayette himself said: "If M. de Favras is not condemned, I will not answer for the National Guard." The main charge against him was his plan to bring troops to attack Paris, but this could never be proved. The only evidence for it was a letter from M. de Foucault, saying: "Where are your troops? From what direction will they enter Paris? I would like to serve among them." This was very vague and no trace of these troops could be found anywhere. On 18 February 1790, despite the lack of evidence, he was found guilty and condemned to death. After he heard the sentence he said to the judges: "I pity you exceedingly if the simple testimony of two men is enough to make you condemn an innocent person." He also remarked, when he saw his order of execution: "“I see that you have made three spelling mistakes." The sentence was to be carried out the next day, at the Place de Greve. On the scaffold, he reiterated his innocence and asked the people to pray for him, before turning to the hangman and say: "Come, my friend, do your duty". The people cheered and rejoiced and some, after his death, were even heard shouting, "Encore!". With great difficult, the National Guard prevented them from tearing his body to pieces and put his head on a pike. Madame Elisabeth, Louis XVI's sister, wrote the next day to the Marquise de Bombelles: "My head and heart are so full of yesterday that it is hardly possible for me to think of anything else. I hope that his blood may not fall back upon his judges. But nobody (except the people and that class of beings whom one cannot call men because it would lower humanity) understands for what he was condemned. He was so imprudent as to wish to serve his king. Behold his crime. I hope that this unjust execution may have the effect of persecutions, and that from his ashes men who still love their country may spring up again to avenge her on the traitors by whom she is deceived. 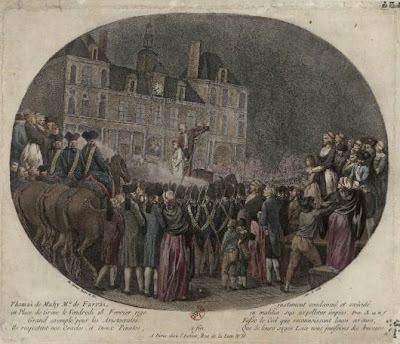 I hope, also, that Heaven, for the sake of the courage he showed during the four hours at the Hotel de Ville before his execution, may have pardoned his sins. Pray for him, my heart; you cannot perform a better work." In another letter to the Marquise, she added: "I was penetrated by the injustice of M. de Favras's death, by the superb way in which he ended his life, and the love he showed for his king (which was the sole cause of his death)," and that, if she has been in Paris she, "would have wondered, like all who breathe in Paris, both at the injustice of his death and the courage with which he submitted to his sentence. No; it is only God who can have given it to him. So I greatly hope he has received the recompense for it. The hearts of honest men willingly render him the homage he deserves. Even the people, the people who cried loudly for his death, said the next day, and, indeed, on returning from the execution, 'But he protested his innocence on the gallows it was very wrong then not to have taken him down." Marie Antoinette was very sad at the Marquis de Favras' death too but was forced to hide her sorrow. She couldn't even console his family as she would have liked. When a few days later M. de la Villeurnoy brought his widow and son to a public dinner of the King and Queen, Marie Antoinette, who was sitting near Santerre, commander of a battalion of the National Guard, dared not talk to them. She later went to Madame Campan's room and cried: "I am come to weep with you. We must needs perish when we are attacked by men who unite every talent to every crime, and defended by men who are very estimable, but have no adequate idea of our position. They have compromised me with both parties by presenting the wife and son of Favras. If I were free to, I ought to have taken the son of a man who had just sacrificed himself for us, and placed him at table, between the King and me; but, surrounded by the executioners who had just put his father to death, I did not even dare to look at him. The royalists will blame me for seeming not to have noticed the poor child, and the revolutionists will be enraged at the thought that in presenting him they expected to please me." She, however, ordered Madame Campan to send them next day several rolls of fifty louis each, with the assurance that both she and the King would always provide for them. It wasn't a promise they could keep for long. Three years later, they were both dead.